We open the film with Sakura Kinimoto, struggling to capture the Arrow Card, which she is able to seal, with a little help from her friends. That night, she has a strange dream about these ribbons that bind her and take her to see a very elegant Chinese lady (that is the woman up there and, yes, she is a degree of displeased). Sakura then magically wins a Winter Break trip to Hong Kong and she takes along Tomoyo Daidouji, her best friend and support team, her worthless brother Toya and his best friend Yukito Tsukishiro (whom Sakura has a crush on). Also coming along for the ride is Sakura’s guardian, Kero-chan (hanging on Sakura’s shoulder) and he is more than he seems, but for the film, he’s in that form. They go to Hong Kong, trying to visit everything they can (Hey, they only had like five days or something like that). As the traverse the Yuen Po Street Bird Garden (in a magnificent looking scene), two malevolent birds chase them down and guide them to a special well. 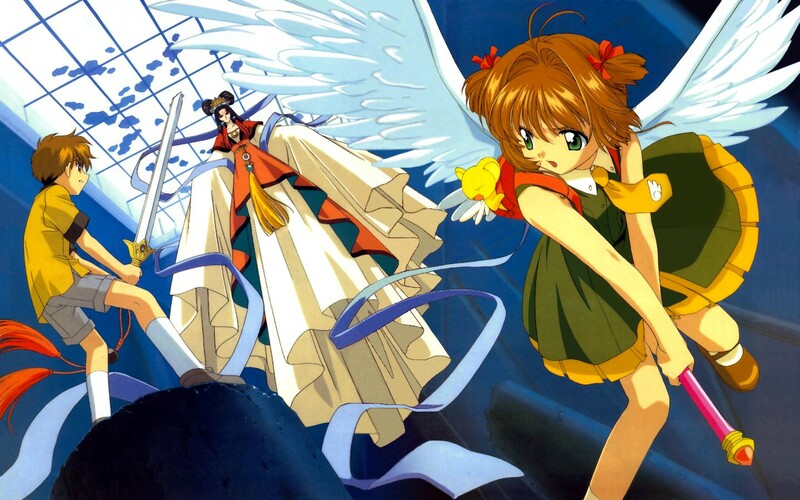 But Sakura is not ready for this part of the journey and is, instead, taken to the house of her friend, Syaoran Li, who is also quite aware of what Sakura really is. At the estate, Sakura meets mother Yelan, who has a sense that Sakura is in danger. After another dream, Sakura knows what has to be done. She visits the well to confront her fears and learn the truth about this woman. For the most part, I felt this was a very thin film. It was 80 minutes of basically treading water. Although there were some humorous scenes, it felt more that they had to pad things out to reach a particular time length. I assume this could have even been two or three episodes in the series, rather than a full movie. There was no real sense of danger or problems. Just because someone says there is danger (“Beware the Grim!”) does not mean it will come to fruition. It’s just if I have a chance to get to Hong Kong, I don’t want to spend it having to answer questions to a specter that does not know what is going on in the world. But I supposed if you lived in the shadow realm, every day is a day off. I am also going to have to guess that the film assumes I understand the dynamics of the relationships that Sakura has with everyone, as I have obviously seen the series or read the manga (and that’s a no to both of them. Not that obvious). What made the viewing funny is that my daughter thought she had seen this movie before, but realized it was the sequel she saw and not the original. She commented they both kind of start out the same. That’s a bad statement in anyone’s review.